You'll be £25.00 closer to your next £10.00 credit when you purchase Voices From the Past: Armistice 1918. What's this? Order within the next 2 hours, 26 minutes to get your order processed the next working day! At 11.00 hours on 11 November 1918, the guns fell silent across the battlefields of Europe. After the deadliest conflict the world had ever seen, peace had finally arrived. Since the withdrawal from the Somme and the repulse at Verdun, the Germans knew they could not win the war and had sought a negotiated end to the fighting. This was rejected by the Allies and the fighting continued until, almost two years later, with its economy on the verge of collapse, Germany had no choice but to accept defeat and seek terms for an armistice. 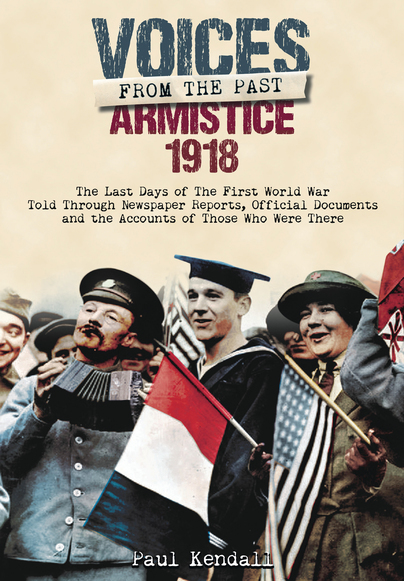 The story of the efforts to bring the war to a conclusion, and those final days and hours of the First World War, are told in the words of the politicians, soldiers and newspaper columnists who were there at the time. From the nervous anxiety of the men on the front line counting down the last few, and in some cases still deadly, minutes, through to the wild celebrations around the world on Armistice Day, renowned historian Paul Kendall relives some of the most emotional scenes ever witnessed through the eyes of those men and women that were there, and had lived, to see the end of the First World War. A fascinating, authoritative book ... arguably the seminal work on first-hand details of WWI's last days and the immediate aftermath, from both the Allied and German perspectives. I have never read such a clear and comprehensive description of the deteriorating situation in Germany in 1918, fuelled by battlefield losses and pessimism following American entry into the Great War, as well by socialist influences undoubtedly stemming from the Bolshevik Revolution in Russia. It’s the best account I’ve ever seen of the military and political developments which ultimately spawned the rise of Hitler .... providing a crystal clear understanding as to why and how he came to power. Valuable reading material for historians and the general public alike. The story of the efforts to end the war, and of the final days and hours are told here in the words of the politicians, soldiers and newspapermen who were there at the time - men and women who had lived to see the end of the Great War. Educated at Queen Mary and Westfield College, University of London, where he also served as an Honorary Midshipman with the University of London Royal Naval Unit, Paul Kendall is a military historian and author from Kent specialising in WW1. He is the author of Somme 1916: Success and Failure on the First Day of the Battle of the Somme.